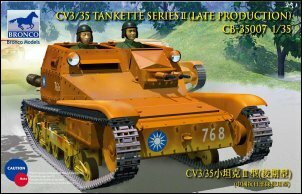 Bronco's kit of the Italian CV3/33 Tankette depicts an early production version, and features great detail and sharp molding. The interior and engine details are very well done. The tracks are link-and-length plastic assemblies. 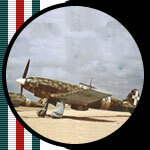 Decals are provided for two versions, and photo-etched metal detail parts are included. A great kit of a fascinating little armored vehicle! Decals and color painting reference for two Regio Esercito (Italian) versions. Decals and color painting reference for two Chinese versions.